In the second half of 2017 KAMAZ will launch sales of the upgraded 5490 tractor unit, which will receive a number of design changes. With the modernization the tractor unit index will be supplemented with the word «neo». KAMAZ-5490 Neo has the following differences from the original model: wheelbase increased by 200 mm (which allowed optimizing the load distribution between axles), reinforced front suspension with maintenance-free silent blocks instead of bushings and flat top of rear wings (helps to avoid contact with the semitrailer). The basic version of KAMAZ-5490 Neo is equipped with fuel tank of 695 liters. At the customer’s request the fuel reserve can be increased to 1095 liters due to the additional fuel tank capacity of 400 liters, installed instead of the spare wheel holder on the tractor unit frame. KAMAZ-5490 Neo will be still equipped with diesel engines Daimler OM457LA capacity of 401 or 428 HP, combined with 16-speed ZF manual gear box or 12-speed automatic gear box of the same manufacturer. KAMAZ-5490 has been manufactured since 2013. 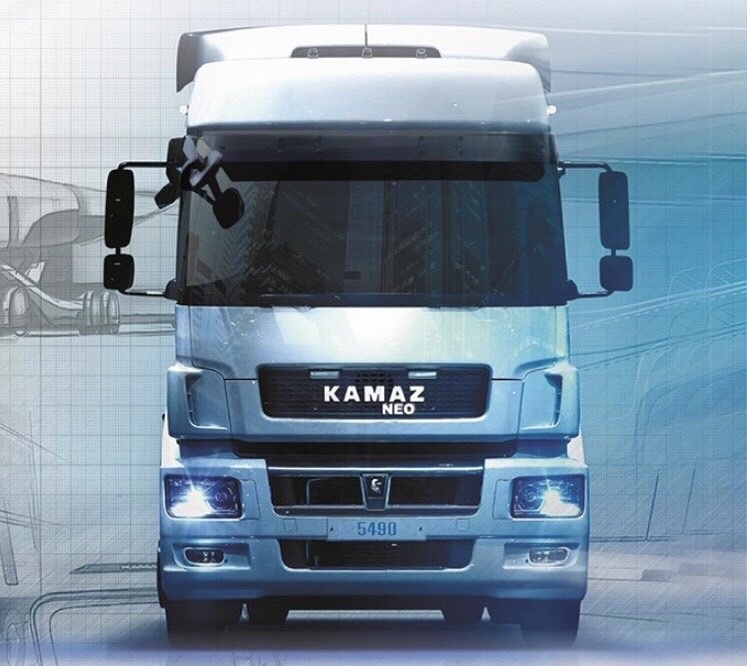 This is the first joint product of KAMAZ and the German Daimler AG.